We make all our statues ourselves. Our plaster of paris statues are suitable for indoors only. 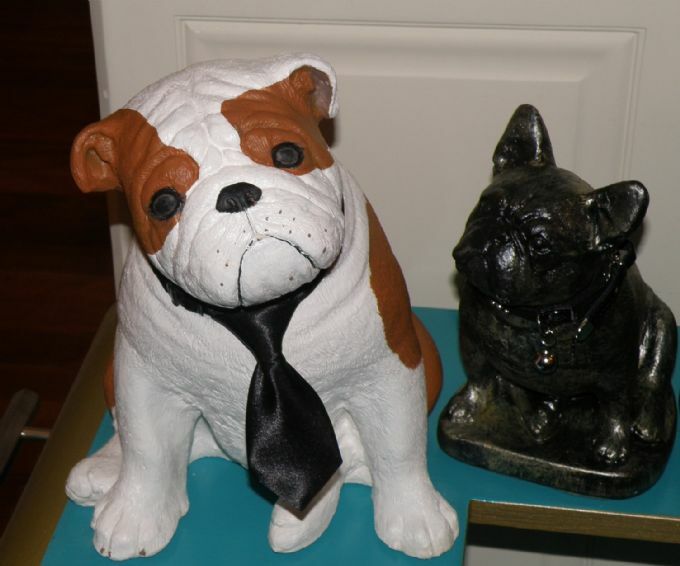 Concrete statues for indoors or outdoors. 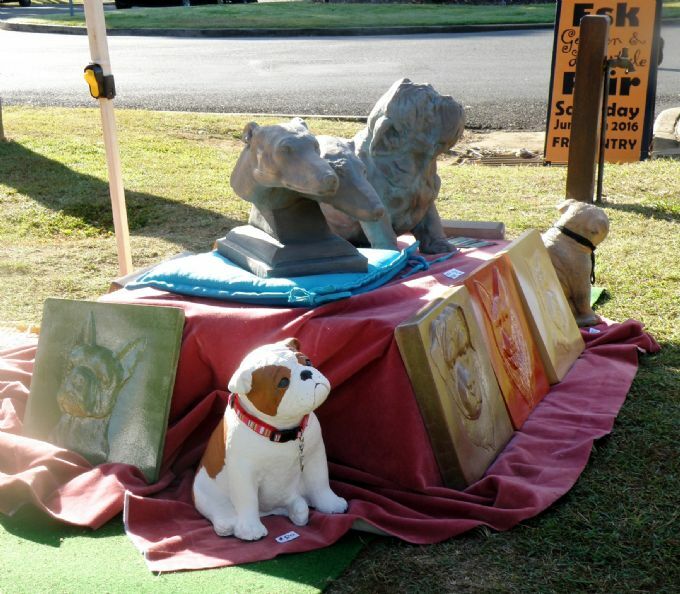 Statues can be picked up from Wivenhoe Pocket/Fernvale or postage of smaller items can be arranged. The big concrete statues are very heavy and pick up only. We can deliver to Brisbane for an extra delivery fee if there is someone to help your end with the statue. 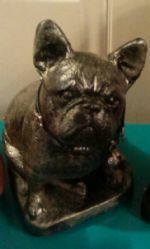 We have the Pug, Greyhound bust, huge British, XL French Bulldog, Golden Retriever, English Sheep Dog, Bassett, Dalmatian, Maltese, and Dachsund to name a few. I'm working on a large Schnauzer soon to be completed, a vintage Collie that we have sourced to make a wonderful mould from and a Stafford in the making. Adding addition breeds so email for your breed. Paver size hanging wall plaques of Pomeranian, Cocker Spaniel, Ladrador, German Shephard, Shih Tzu, Schnauzer, Rottweiler, Boston, Dachsund and Pointer. Update and photos of 15th May 2016. 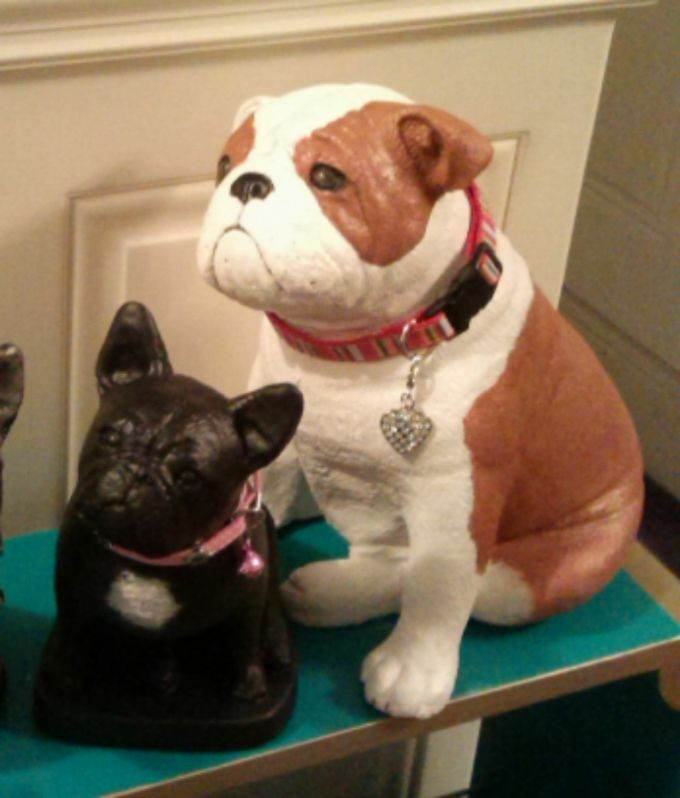 Sitting Pretty Statues attended the Million Paws Walk in the township of Esk. 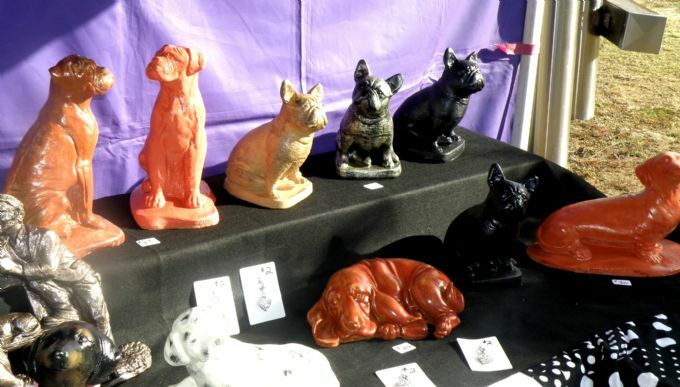 Great day and fabulous people stopping by to admire the various statues on sale/display. The larger dog items are stunning and very heavy to be lifting in and out of vehicles. They will in future be made to order only. Photos can be emailed to you, viewing the staues can be arranged. 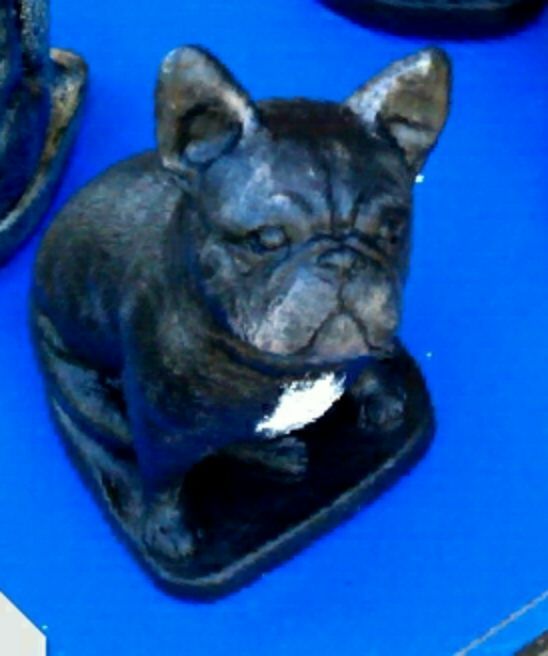 French Bulldog made of plaster of paris. Weight 3.2 kgs. Size 24cm x 23 cm x 14 cms. Felt bottom. 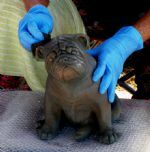 French Bulldog made from plaster of paris. Painted in bronze colour. Weight 3.2 kgs. size 24 cm x 23 cm x 14 cms. felt bottom. British Bulldog individually hand painted, no two the same. Plaster of paris. Felt bottom. Size 30 cm x 26 cm x 26 cm. British bulldog individually painted, no two the same, made of plaster of paris. Weight 8 kgs. Size 30 cm x 26 cm x 26 cm. Boxers, Frenchies, sleeping Basset, Dalmatian and Dachshund. All made from concrete. Ask for measurments. 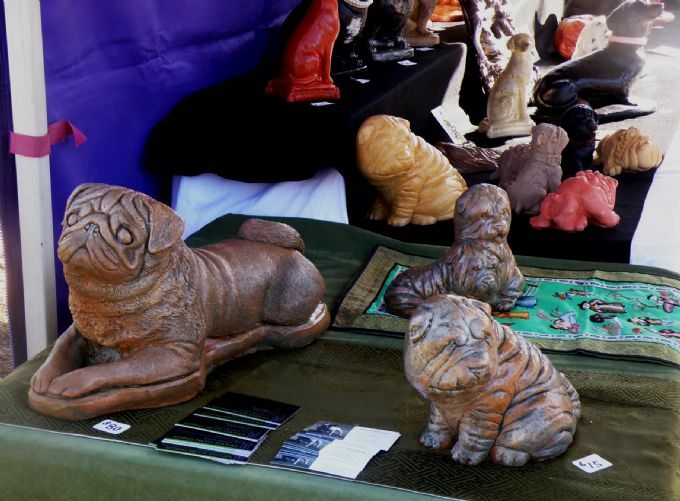 Shar Pei's $20 or $15 depending on the statue. 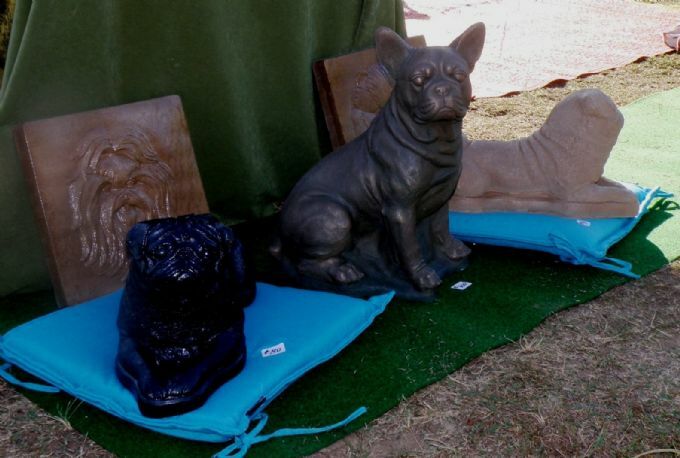 Both Pug and Shar Pei's are clay colour with a green patina finish. Wall plaques with hook, paver size $25. XLarge British Bulldog $300 Bronze finish. Heavy, great size. 2 greyhound heads make a statement $300 for one, or $500 for 2 statues to line the driveway. In a bronze finish. Heavy, great size. 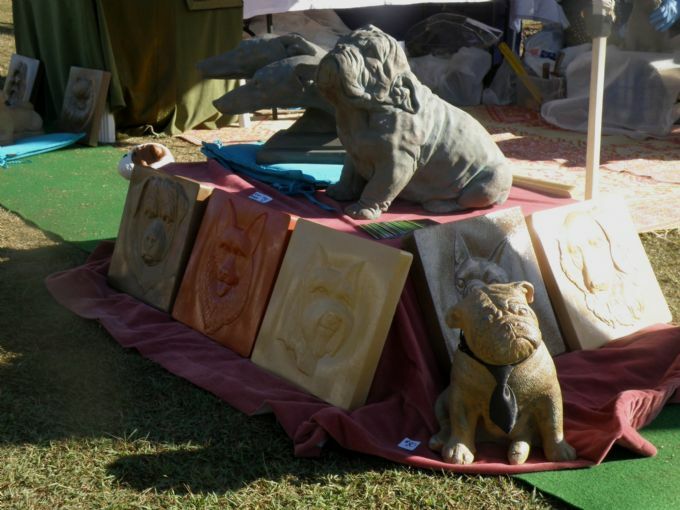 Wall plaques of different breeds $25 and the Large British in other colours made from lighter plaster. $80 for indoors. Another view of the fab XLarge British.